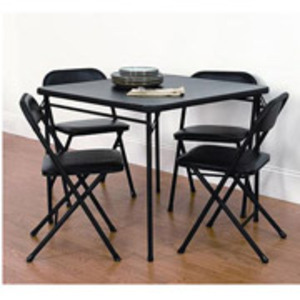 Provide extra seating for your family and friends with this card table and chair set. 2 SETS AVILABLE This 5 piece table and chair set is perfect for parties or occasions where a dining table set is needed. It's big enough for 4 people to play card games, make crafts, or share a meal. The chairs feature vinyl upholstered seats, metal chair backs and the table top is made out of PVC, making this table set very comfortable and easy to clean. 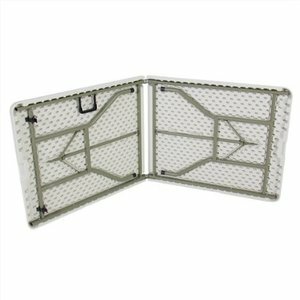 •Easy-to-clean vinyl upholstered chair seat with comfortable foam pad •PVC table top makes it easy to manage spills •4 sturdy chairs •Card table and chair set is easy to fold for convenient transport and storage.